Polyester mesh is the most common of screen printing meshes, woven from synthetic polyester thread. It boasts solvent, water, and high temperature resistance, and comes in a wide range of specifications. Because of its low stretchability and good tensile strength, poly mesh is ideally suited for applications that require dimensional accuracy and repeatability. Alpha (α) Series polyester monofilament mesh is designed for precision screen printing applications including printed circuit boards, nameplates, glass, graphic, and decal printing. It encompasses a wide range of mesh specifications that utilize NBC’s UX-Screen or L-Screen threads1, and have been treated with NBC’s proprietary NEWSUPER treatment as well as their advanced heat-setting process. L-Screen is a conjugated high modulus polyester thread woven with a super hard polyester core for optimum strength, and a soft polyester sheath for optimum emulsion adhesion. This combination results in a 16% stronger material with significantly lower elongation when compared with solid thread material such as EX Screen. L-Screen is standard on all mesh counts with a thread diameter of 27 and 30 microns, and is also available upon request as a specialty item in select mesh counts with a 35 micron thread. UX-Screen is NBC’s super high modulus polyester mesh. This “next generation” mesh possesses all of the features of its predecessor, EX Screen, with the added benefit of an 8% increase in strength. UX-Screen is available in various mesh counts with a thread diameter ranging from 33 to 45 microns. NEWSUPER is a proprietary combination of NBC’s unique chemical and atmospheric plasma, or corona, treatments. It modifies both the surface properties and the structure of the thread at the submicron level. 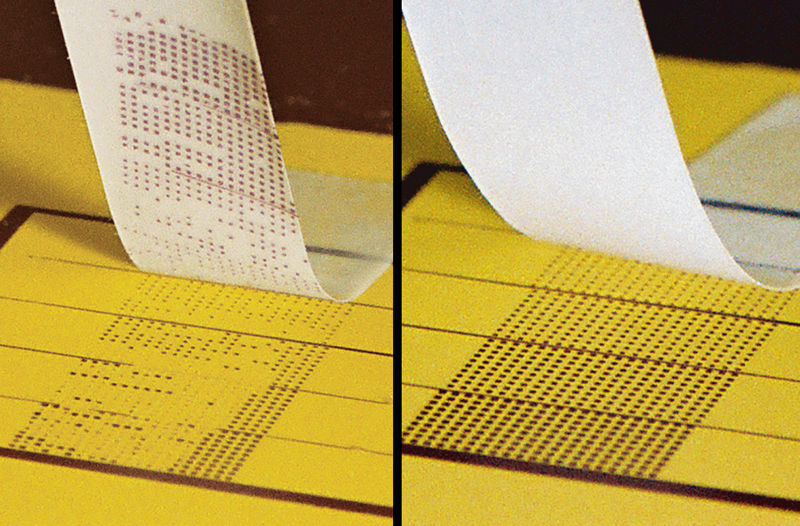 The modified surface properties result in reduced contact with paste/ink particles, allowing for smoother paste/ink transition, and making Alpha mesh ideal for halftone and fine line printing. Additionally, the NEWSUPER treatment enables the mesh to cling to the emulsion or capillary film tighter, prolonging screen life, especially in long print runs or when using abrasive paste.